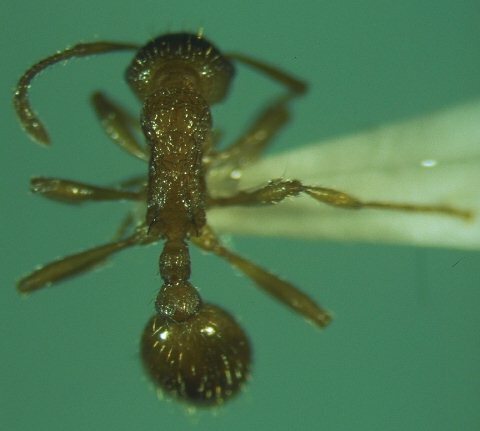 When you talk to people, they all say that ants sting, well they don't, but this one above, of which there are several species, does and when it does it hurts because it injects you with formic acid from it's sting. These species of ant are normally found in the garden and under stones, flags etc., where they are abundant. The following summer eggs that she has laid develop into larvae and may mature into adult workers. She feeds the first brood and herself on stored reserves of protein. Mature workers begin to collect food and care for younger siblings. The workers are all female, all sterile and never develop wings. After 9 years the colony contains about 1000 workers and still a single queen who has laid all the eggs. Mature colonies begin to produce new reproductives, winged females and males that eventually leave the nest on their nuptial flights. The colony dwindles and dies after the queen has died. This is a typical sort of life cycle for most temperate social insects but the details may vary massively. 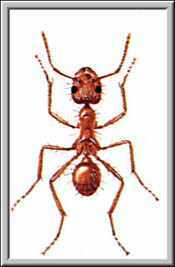 Myrmica rubra - found throughout Britian, but mainly seen in the South. has colonies of about 100 ants. Myrmica ruginodis - perhaps the most common of the Myrmica family. Colonies can reach a size of several hundred members. Males and females copulate during a "nuptial flight" in August or September (only sexual forms can fly). The Queen loses her wings after nuptial flight and spends the first winter in a nest chamber which she has excavated. The following summer eggs that she has laid develop into larvae and may mature into adult workers. She feeds the first brood and herself on stored reserves of protein. Mature workers begin to collect food and care for younger siblings. The workers are all female, all sterile and never develop wings. After 9 years the colony contains about 1000 workers and still a single queen who has laid all the eggs. Mature colonies begin to produce new reproductives, winged females and males that eventually leave the nest on their nuptial flights. The colony dwindles and dies after the queen has died. This is a typical sort of life cycle for most temperate social insects but the details may vary massively. First few weeks of life are spent handling dead prey, feeding the larvae and the queen with regurgitated food, cleaning the nest and guarding the entrance of the nest. 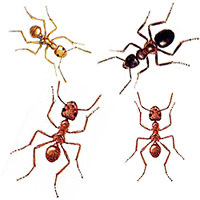 Later workers do jobs outside the colony such as foraging and defence against enemies. In Myrmica whether a larvae develops into a queen or a worker depends upon factors such as nutrition, temperature and the age of the queen who laid the egg. Large blue butterflies can usually only survive and develop in the nests of a single species of Myrmica ant, the primary host. Although a few individuals may be able to develop in the nests of other secondary hosts, the vast majority of the individuals of any population will develop in nests of the primary host (Thomas et al. 1989). The Alcon blue seems to be different from the other large blue butterflies in that it is known to use different primary host ants in different parts of Europe (Elmes et al. 1994). 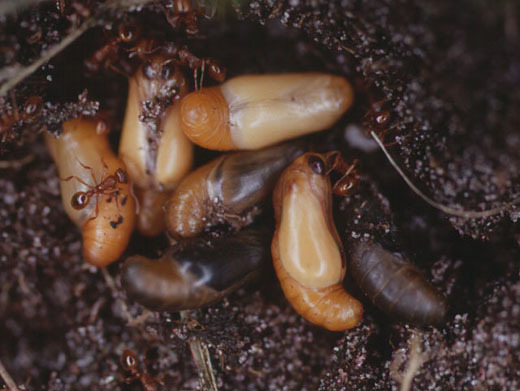 Populations in Spain use Myrmica scabrinodis as the primary host. Populations in the Netherlands use Myrmica ruginodis as the primary host, and Swedish populations use Myrmica rubra as the primary host.